Zinc, along with its sister metal lead, are widely expected to continue riding the commodity boom through 2018. A combination of scheduled mine closures, strategic supply cuts by major supplier Glencore, and environmental measures in China contributed to a tight market in 2017 and a drawdown in global stocks. Price support should continue this year with Chinese demand forecast to remain solid, backed by demand from automotive and consumer goods manufacturers. Predictions are that zinc will hit US$4,000/t — up from the current US$3,300/t which is already above ten year highs. Both zinc and lead are both relatively stable and not in a bubble — each with a proven history as stable base metal products. These market fundamentals have unlocked a chance for junior explorers that are willing, and able, to seize and capitalise on the opportunity. 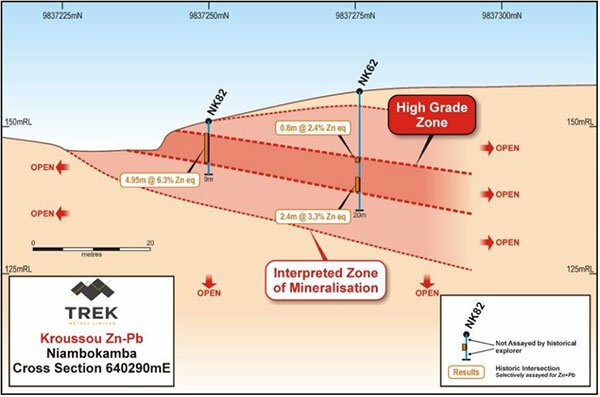 Having spent the past 12 months progressing exploration at the underexplored yet promising Kroussou Zinc-Lead Project as part of a JV, Trek Metals (ASX:TKM) is forging ahead with its zinc and lead ambitions. 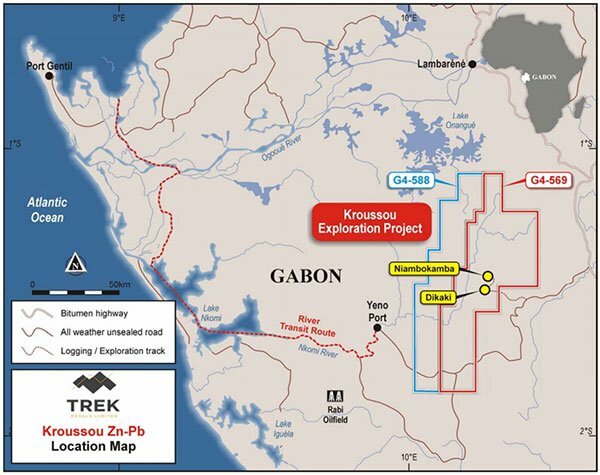 The company is just days away from finalising its 100% acquisition of the Kroussou Zinc-Lead Project in the African nation of Gabon, after previous exploration shored up the company’s belief in the project’s potential. 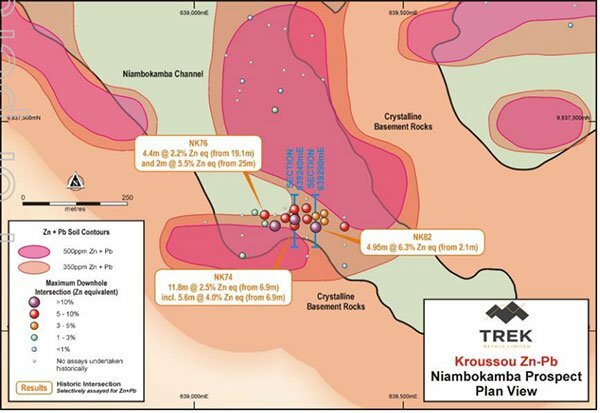 Backed by recent exploration and historical data, TKM has plans to kick off a drilling programme later this quarter and is working towards establishing a JORC Mineral Resource at the project. Before we go too far, it should be noted that this is a very high-risk, speculative stock and investors should seek professional financial advice if considering this stock for their portfolio. 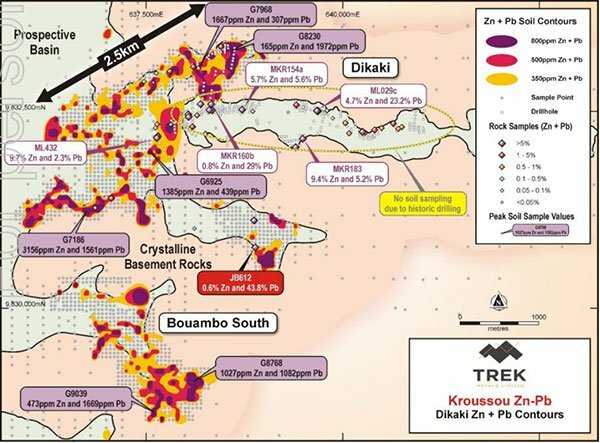 The Kroussou project area is highly prospective for zinc and lead mineralisation, showing areas of significant near-surface base metal mineralisation along a strike length of 85 kilometres. Yet historical exploration has barely scratched the surface of what’s on offer... Only a slither of the project’s prospects were drill tested when it was previously explored from the 1960s through the 1980s and this drilling was limited to shallow depths. That amounts to significant upside zinc-lead potential remaining for TKM at Kroussou. 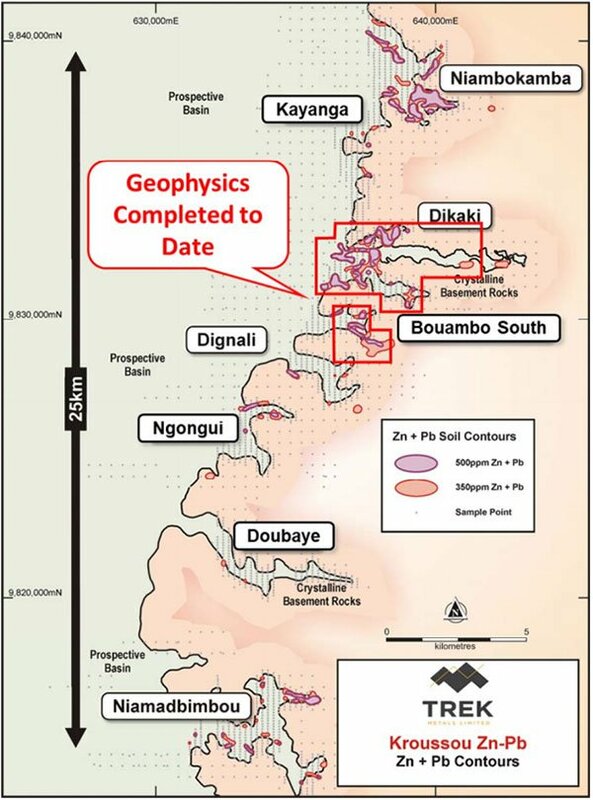 Two areas that saw historical drilling are Dikaki and Niambokamba. 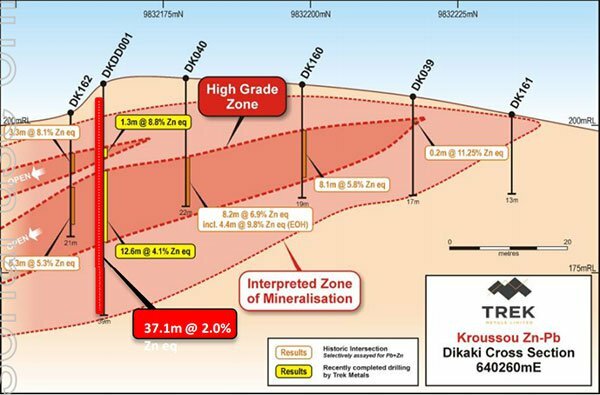 Dikaki is TKM’s near-term priority area where it’s hoping to capitalise and expand on previous drilling. 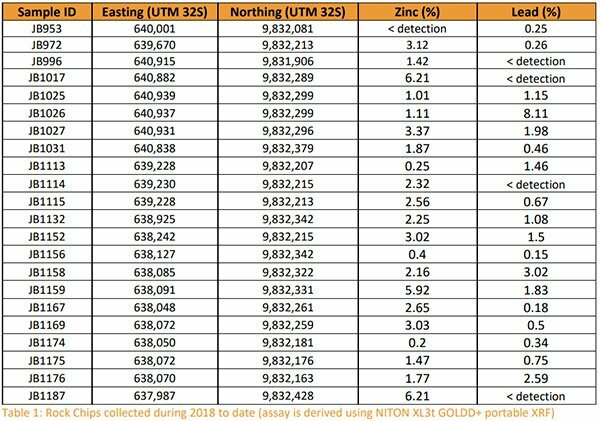 So far, promising intercepts from various depths have been recorded including 8.3m at 7.8% zinc-lead, 4.2m at 4.9% zinc-lead, and 1.3m at 23.3% cent zinc-lead. TKM’s initial exploration programme boosted its confidence to progress exploration, and it undertook soil surveying then mapping and rock chip sampling. The company also just completed a programme of geophysics — IP and NSAMT. Exploration to date confirms the potential for significant, very large scale, near surface mineralisation and remains grossly underexplored. TKM will continue amassing information over the coming month or so to determine ideal drill targets with plans to start drilling in Gabon’s dry season, beginning around May-June. Backed by a surging zinc price and anticipated strong demand for the metal going forward, along with steady demand for lead, TKM looks to have what it takes to progress exploration at Kroussou and build some attractive shareholder value in the process. 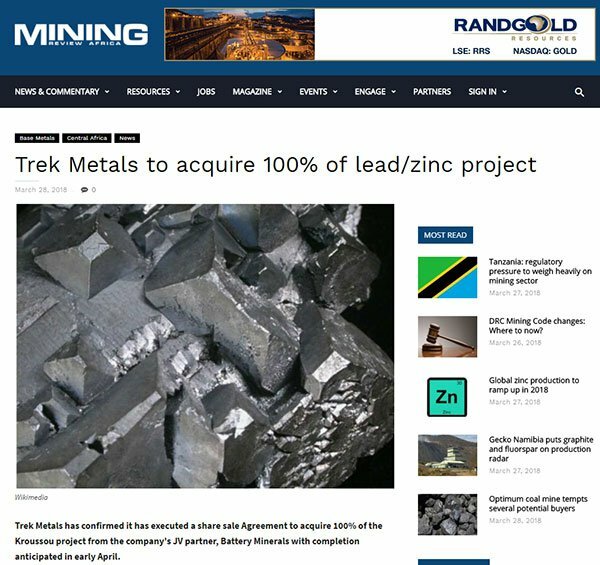 While Trek Metals Limited (ASX:TKM) is actively positioning itself in the zinc-lead space, it also holds exposure to the new energy metals markets. In January the company gained significant exposure to strategic commodities for the booming battery market when it added to its portfolio multiple licence applications in the NT that are highly prospective for lithium and cobalt, as well as historical reports of tin, tungsten, copper, tantalum and niobium. TKM also has two exploration tenement applications in the Northern Territory known as the Lawn Hill Project. The tenements contain highly prospective geology with the potential to host large scale sediment hosted zinc-lead deposits similar in style to the World Class Century deposit. However, at least for the immediate future, TKM’s main focus remains on its African zinc-lead project. 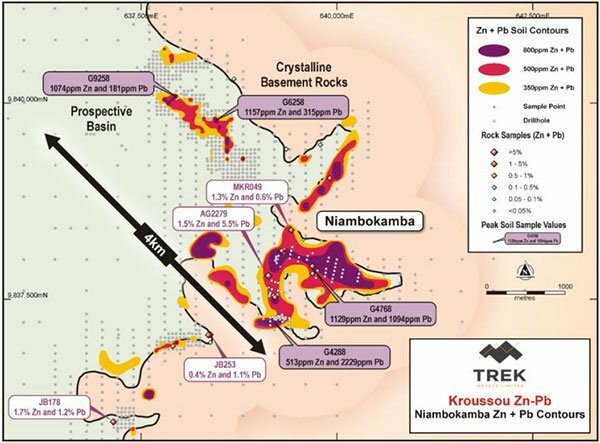 In the coming days Trek Metals Limited (ASX:TKM) will finalise its acquisition of 100% of the promising Kroussou Zinc-Lead Project in the African nation of Gabon, which we discussed in out last update on TKM in February — ASX Junior Hunting Elephant Sized Zinc and Lead Orebodies in West Africa. The company last week announced that it had completed a share sale agreement to acquire the Kroussou project from Battery Metals (ASX:BAT), with the deal expected to be finalised early this month. TKM has been progressing exploration at the project over the past 12 months in a JV arrangement alongside BAT. This exploration has shored up enough confidence in the project’s potential for TKM to commence drilling during the region’s dry season later this quarter. Completion of the acquisition removes any obligations to another party, freeing TKM up to go ahead with the project unencumbered. It will deliver flexibility in undertaking exploration activities as well as longer term strategic flexibility when considering various options to maximise the project’s value. The upside for Battery Minerals is that the deal allows it to remain focused on its graphite work in Mozambique. With the project’s 2500 square kilometres and its 85 kilometres of strike — which has seen only limited historical exploration — there remains plenty to be revealed once drilling gets underway. 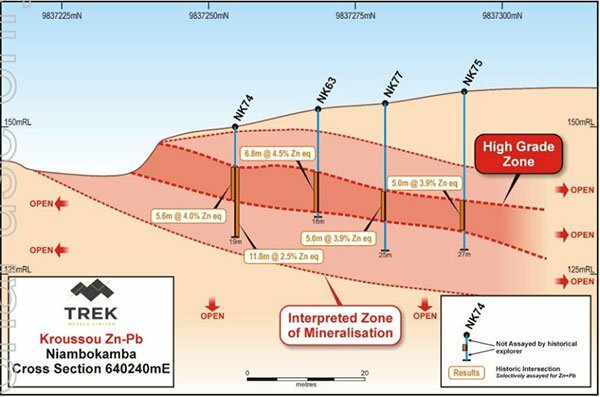 On February 22, TKM reported that preliminary modelling continues to indicate significant mineralisation potential. It suggests that conductive responses are present down‐dip and along strike from known mineralisation. Further, conductive responses that are potential sub‐surface expressions of the recently defined soil anomalies are present within a northern lobe of the Dikaki channel extending westwards into the basin itself. This programme, consisting of both IP and NSAMT methods continues to present significant anomalies to assist with drill targeting. The geophysical anomalies appear to be reflecting the surface geochemistry quite nicely, delivering confidence that the data being compiled will lead to robust drill targets that will potentially present game changing opportunities. An ongoing programme of rock chip sampling associated with geological mapping within the main prospect areas is also continuing to show the widespread nature of mineralisation present at Kroussou. There is a great deal of work to do here, so investors should maintain a cautious approach to any investment decision made with regard to this stock. The table below presents significant results from the 2018 programme of sampling. Processing of the entire data package, final interpretation and target generation will follow with drill targets to be defined, ready for the commencement of drilling which is currently anticipated during the second quarter. One very encouraging fact is that the datasets that are being amassed at Kroussou are complementary. This combination of geological observation, rock chips, soil geochemistry and geophysics will lead to the generation of quality drill targets and provide for the best opportunity for discovery. Confirmation drilling was completed at two prospects only: Dikaki and Niambokamba. This drilling confirmed the 30-60 year old data from work done historically as valid, although in need of an update. These prospects can be seen on the project map below. 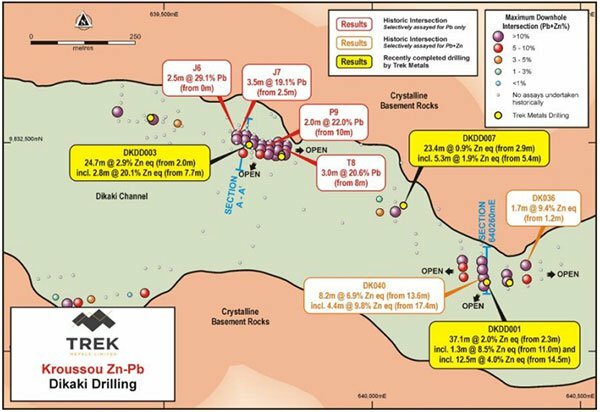 While Dikaki has seen only limited exploration, the confirmation drilling that has been done to confirm historical findings has been ‘highly successful’. 12.5m at 4.0% Zn eq from 14.5m. 2.8m at 20.1% Zn eq from 7.7m. These drill holes and others at the two channels can be seen on the below cross sections. The prospect exhibits broad, high-order soil anomalies with 20 strike-kilometres of anomalism at greater than 500ppm zinc + lead. Peak soil results included 3,156ppm zinc and 2,410ppm lead with greater than 10% of samples containing more than 500ppm zinc + lead. Large geophysical anomalies within the Dikaki Channel highlight the potential for extensions to known mineralisation. Inversion modelling suggests significant targets from near-surface to approximately 100m below surface. Open pit targets from surface. The coincident soil anomalies target remains open. - TKM will acquire 100% of the issued capital of BAT's Mauritian subsidiary, Select Exploration, which holds a 100% interest in the Kroussou project. 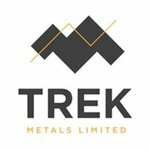 the issue of $200 000 of Trek Metals' shares based on a 5‐day VWAP prior to the date of issue and subject to a minimum floor price of $0.025 and one free attaching option for every two consideration shares issued. - The consideration shares will be subject to a 12‐month voluntary escrow period. 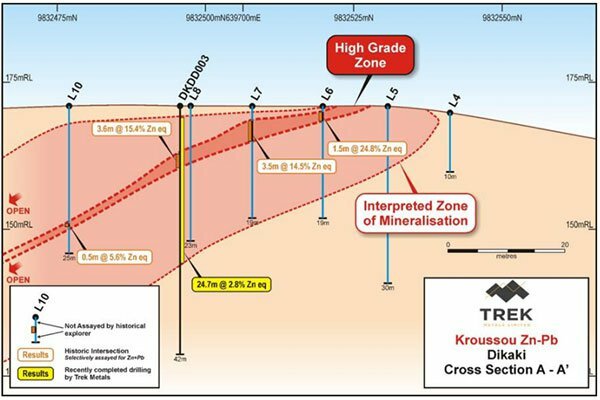 - Upon TKM defining a JORC‐compliant Indicated mineral resource estimate of more than 250,000t of combined zinc-lead at Kroussou, TKM will issue BAT $2,500,000 of TKM shares (5‐day VWAP prior to the date of issue) and one free attaching option for every two deferred consideration shares issued (subject to shareholder approval). - TKM will grant BAT a 2.5% net smelter return royalty on gross sales revenue (NSR Royalty) with TKM having an option to buy back 1% of the NSR Royalty for $1,500,000. - An existing 0.75% net smelter return royalty payable to a third party, which can be bought back for $250,000, will be novated from BAT to TKM. Kroussou ticks all the boxes when it comes to acquiring a project and offers the chance to come across a genuine big discovery — all that’s left now is to get on with exploration and find it. While Gabon is located in the same geographical region as the Democratic Republic of Congo in Africa, it doesn’t carry the extensive risks of the DRC or some other Africa mining jurisdiction as it’s geopolitically very different. As one of Sub-Saharan Africa’s most prosperous countries, Gabon has a per capita income that’s about three times the regional average in that part of Africa, and it has not been subject to wars and civil unrest. Gabon boasts a politically stable democratic government and its mining laws and taxation arrangements are clear and descriptive and supportive of foreign investment. The government has introduced specific mining investment codes to encourage investment through customs and tax incentives and is upgrading all major roads and launching a massive port modernisation plan that will cater for 90% of commercial traffic. 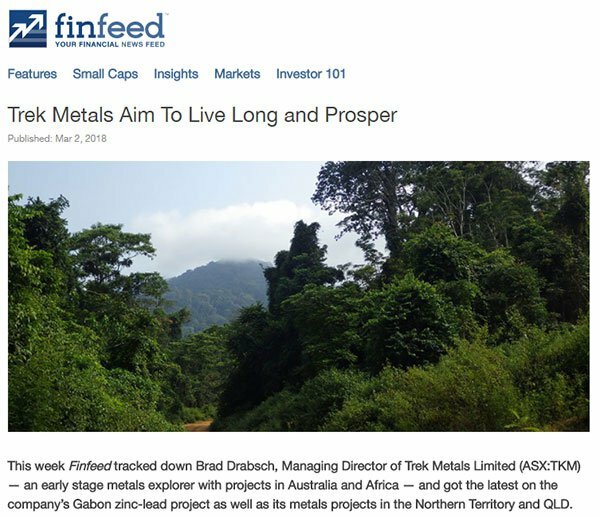 Financial news website, Finfeed.com (a related entity of S3 Consortium) met with TKM Managing Director Brad Drabsch to get the latest on the Kroussou project as well as its Australian metals projects. Having completed an initial drilling programme to confirm historic data at the project and support further exploration, including drilling beginning this quarter, as well as TKM to take over 100% ownership of the Kroussou Project any day now, the company is progressing its plans nicely. 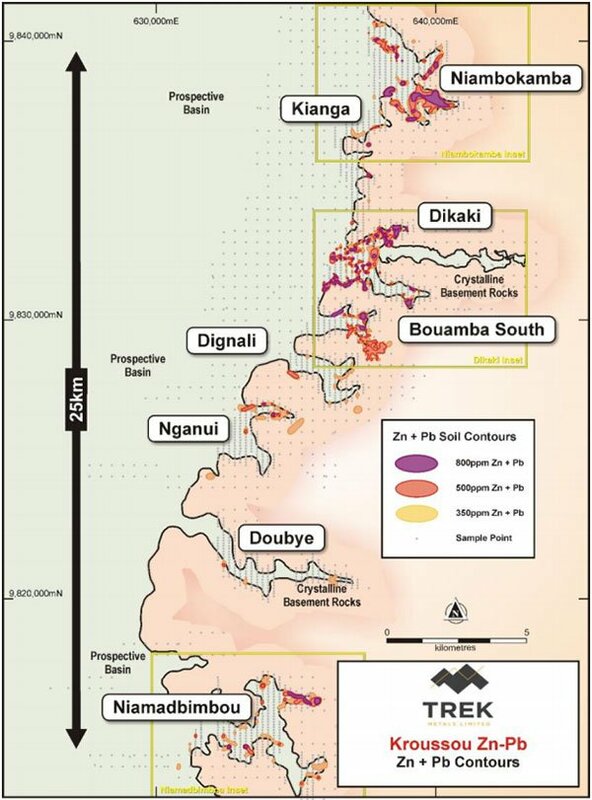 With Kroussou, TKM has the potential for the discovery of a very significant zinc-lead orebody in Gabon. It certainly has potential to emerge as a zinc and lead behemoth — all the ingredients for that to happen are there. And it’s all happening at just the right time as the price of zinc and lead continue to appreciate to near record levels. Not forgetting its Australian assets, TKM’s commodity mix provides opportunities in both the base metals market (lead and zinc) and mobile energy storage (lithium and cobalt).